← How Can the Terms of the SFA/SPL/Rangers 5-way Agreement be Discovered? The Latest Sayings of Rangers’ Charles Green – Blackmail, Terrorists, Desperados and Ratner-esque “Worst Rangers Team Ever”! Mr Green has been, by his standards, quite quiet recently. However one cannot keep a good man down! On the back of the excellent results for Rangers announced last week, Mr Green made some comments. I have extracted them from the STV website here. My observations on his bons mots as in bold. Excellent! Well done! After all, if there is no debt then the club/company/holding company (delete as appropriate) cannot end up in the same mess as oldco managed! Just a couple of points come to mind (but as Mr Green’s business record is infinitely better than mine, I am sure I have simply misunderstood the implications of what the Businessman of the Year has had to say). Firstly, there was a statement before about “no external debt”. This lead to people wondering what “internal” debt was. Surely debt is debt? Now we are told that there is no “bank debt” or “institutional debt”. Which leaves other sorts of debt, doesn’t it? Secondly, whilst the aims of (a) never having bank debt and (b) never giving security over the assets are laudable. Is Mr Green not creating a hostage to fortune by stating now that that will never happen? Based on the present figures there is a net outgoing of around £1 million per month. Whilst the highly successful share issue raised many millions, that would be spent within two years unless there is higher income which is not matched by higher costs. Raising working capital by way of a share issue, which short of increased revenues is the only way to do so, rather than by borrowing can be a less than perfect way of doing so. After all, subsequent share issues tend to dilute the existing shareholders’ shares. Especially now, when interest rates are, and have been for four years, at historically low levels in the UK, then money is actually very cheap. A prudent businessman would know that and be prepared to exploit the low rates if finds were required. Looking at the Annan v Rangers result, and the proposals regarding league reconstruction, Rangers might need to spend a lot more to get back to the highest level in Scotland. Will this be raised by shares being issued or by borrowings? And, after all these declarations, what will happen if Mr Green at some later stage does approach a bank for a loan for Rangers. Will the reaction be that there must surely be some undisclosed panic? For a usually sure-footed businessman, I think that, in his efforts to appease his anxious fans, he might have dug himself his own pitfall! “That (the winding up threat) was them making demands which were outwith what I had agreed with them for fees in raising equity. These comments relate to Orlit Enterprises and their dispute with Rangers over a bill. I wrote before about the seemingly defamatory comments made by Mr Green about Orlit, notwithstanding a prior connection, even if tenuous, between the company and the bluff Yorkshireman. To refer to someone as indulging in blackmail, or as being a terrorist, all for the temerity of asking for a bill to be paid (even one which is disputed) would seem to me to open up the door to litigation somewhere. If it was in Singapore, where Orlit is based, then libel/defamation can be a criminal offence, and in that case Mr Green might not want to stop over in that nation if he is in the area. If Orlit do sue, then I suspect some of these comments will return to haunt Mr Green if asked in court about them – but that is a long way off. As for Mr Green stating that he (presumably “Rangers”) will never pay more than was agreed, then I assume this might make people dealing with him be very sure to have contracts watertight before starting. In the Orlit case we have the choice of believing Mr Green or the Singaporean company. I suspect that it is not as simple as an agreement that Orlit was to be paid a specific sum. The discussion about the matter suggests that the figure was dependent on the success of fund raising. Therefore, rather than one side making spurious demands, or the other making false and provocative denials, there might be the simple solution – Orlit think their contract means one thing, and Rangers think it means something else. Orlit could help out the ailing legal profession in Scotland by pursuing this, and Rangers could assist by defending it! If Mr Green intended to gee up his team, then he seems to have failed. The next match after he said this, his players lost 2-1 to Annan Athletic at Ibrox, leading to weeping, wailing and gnashing of teeth amongst the faithful. His words above seem to be a reverse “vote of confidence”. The team is the worst ever. The fans are not happy. The board is not happy. The responsibility lies with the manager and with Mr Green. Mr Green supports the manager. The manager’s job is safe. Does anyone else see a logical flaw in that? If the responsibility, or blame, lies with Messrs McCoist and Green, and the Board is not happy, does that suggest that their fates are inter-twined? It would be very difficult for Mr Green to send Mr McCoist off to pastures new whilst remaining in place himself. Whereas before there could have been a case for Mr McCoist, if performances were not as expected, to move on, then he could not do so now without being seen to have “walked away”. In addition, as a shareholder with around 1 million shares, it would be harder to get rid of him than another official who had no shares. It is the traditional response of the “big” team on having trouble with a “wee” team to blame the pitch. Visions come to mind of the old Boghead, which in the depths of winter was perfectly named, or of the field for the famous Hereford v Newcastle game in 1972. I am sure those who follow Rangers can correct me, but I suspect few, if any, of their games have been played on pitches such as those. And the state of the pitch surely does not explain the two league draws and the Annan defeat at Ibrox? Then we see Mr Green complaining about the rules! He seems to imply that Rangers were hard done by because they were only allowed 22 players over 21. But that is the SFL rule. Did he expect that, as part of the SFA/SPL/SFL agreement to “facilitate” Rangers entry to SFL3 that restriction should have been eased for them? He then proceeds to call players who, it seems to me, perfectly legally exercised their legal rights not to join newco “desperados”. a desperate or reckless person, especially a criminal. Accusations of criminality are often actionable. Is it wise for Mr Green to be personally abusive of people against whom he is engaged in litigation (or at least SFA arbitration)? And, correct me if I am wrong, but one of the big triumphs proclaimed by newco in its recent accounts was the cutting of the wage bill. If all of the players who left under TUPE had stayed, then the wage bill would not have dropped. However we are told that the wage reductions were budgeted for. That shows clearly that Mr Green’s problem was not that the players left, and thus could not play for newco, but that newco could not sell them and receive transfer fees for players who in all likelihood would played at most one or two games for newco Rangers. It should also not be forgotten, though it seems to have been by everyone Ibrox-related, that the “desperadoes” gave up around ¾ of their salaries for 3 months to help oldco get to the end of last season. I am not aware of Mr Green promising to put that back into the players’ pockets (though he had of course no legal liability to do so). Will Orlit Enterprises or the “desperados” sue Mr Green for defamation? Almost certainly not. Is it wise for a CEO of a listed company to be so outspoken? Should he be making statements about how bad his product is? 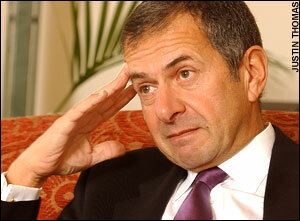 Does he not recall Gerald Ratner? He added that his stores’ earrings were “cheaper than an M&S prawn sandwich but probably wouldn’t last as long”. The result? £500 million wiped off the value of his company’s shares. Mr Green surely hopes history does not repeat itself. Just read old Charlie’s latest comments about Rangers DESERVING to be in the new 1st division. This is risable! What he is saying is that the rules are that we should be in the second but I am going to run out of money unless I can get back into the SPL and Europe soon. By the same token I am DESERVING of a Eurolottery win but I suspect that my view on that doesn’t matter.